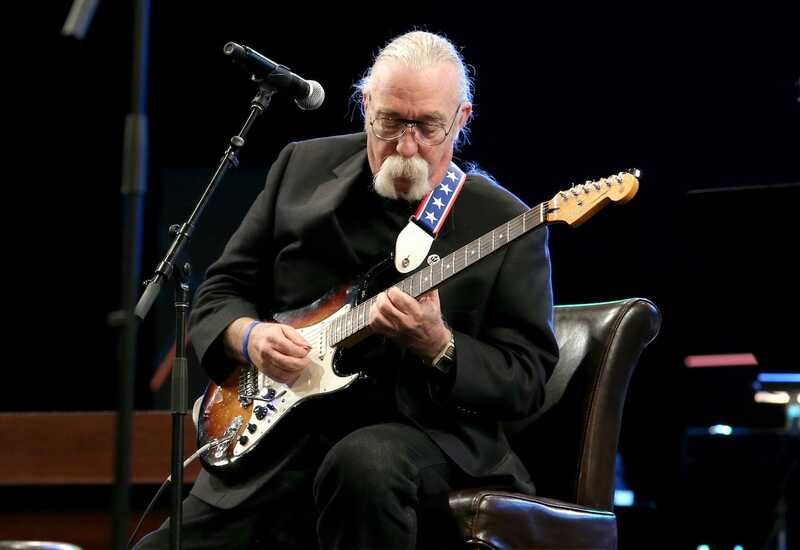 Jesse Grant/Getty ImagesGuitarist Jeff Baxter at the 31st Annual NAMM Technical Excellence & Creativity (TEC) Awards in Anaheim, California, January 23, 2016. President Donald Trump signed a bill making changes to music-copyright law on Thursday. Among the musicians in attendance was Jeff “Skunk” Baxter, a guitarist for the Doobie Brothers and Steely Dan. Unlike his peers, Baxter has also cultivated a career in the Pentagon, building a reputation has an innovative thinker. Jeff “Skunk” Baxter has earned eight platinum records in a music career that started in the 1960s, and he has received numerous security clearances and contracting jobs since the 1980s as a self-taught expert on missile-defence and counterterrorism. Baxter was one of many luminaries at the White House on Thursday to watch President Donald Trump sign the Music Modernisation Act, which reforms copyright laws. Unlike every other musician in the room, including Kid Rock, Baxter has built a successful second career as a defence consultant. Baxter dropped out of college in Boston in 1969 to join a short-lived psychedelic-rock band. 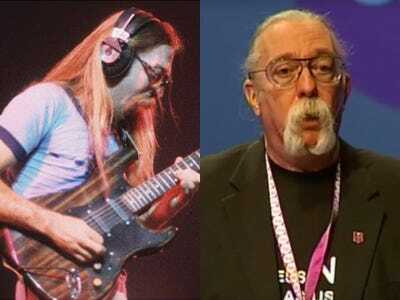 After that, he moved to California and become one of the original six members of Steely Dan, which he left in 1974 to join the Doobie Brothers, which he left in 1979. While living in California in the 1970s, Baxter helped a neighbour dig out their house after a mudslide. Baxter found the technical aspects of music and of defence, particularly missile defence, coincided. He immersed himself in technical journals and defence publications during the 1980s. 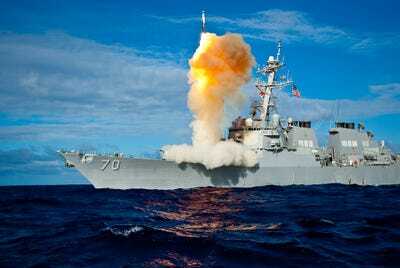 Inspired by a friend’s work on an op-ed about NATO, Baxter sat down and punched out a five-page paper on the Aegis ship-based antiaircraft missile system, arguing it could be converted to a missile-defence system. 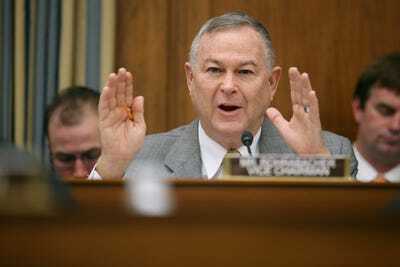 Baxter, who had recently retired as a reserve police officer in Los Angeles, was already in touch with California Republican Rep. Dana Rohrabacher as an adviser. Baxter gave his paper to Rohrabacher. 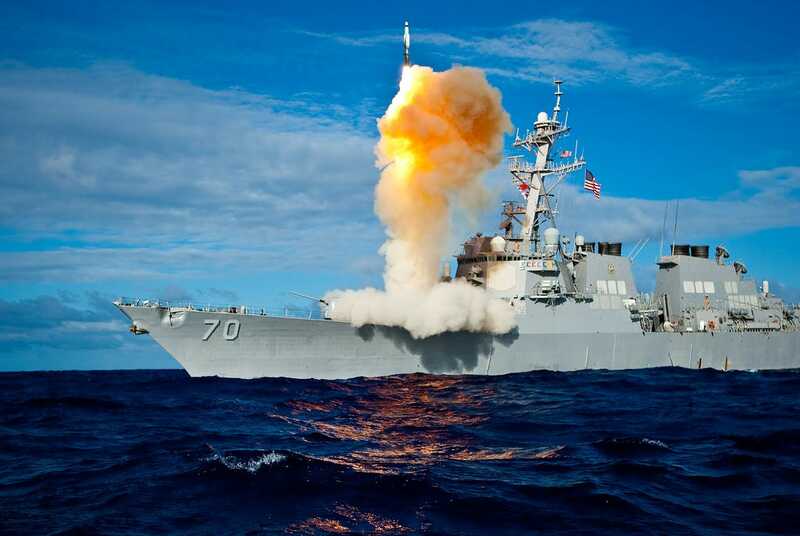 Department of Defence PhotoArleigh Burke-class guided-missile destroyer USS Hopper, equipped with the Aegis integrated weapons system, launches a missile during an exercise in the Pacific Ocean, July 30, 2009. Rohrabacher gave the paper to Pennsylvania Rep. Curt Weldon, a Republican and member of the House Armed Services Committee, who asked, “Is this guy from Raytheon or Boeing?” according to Baxter. Like Rohrabacher, Weldon was struck by Baxter’s prowess. In 1995, he nominated Baxter to chair the Civilian Advisory Board for Ballistic Missile Defence, a congressional panel. “The next thing I knew, I was up to my teeth in national security, mostly in missile defence, but because the pointy end of the missile sometimes is not just nuclear, but chemical, biological or volumetric, I got involved in the terrorism side of things,” Baxter told MTV in 2001. Chip Somodevilla/Getty ImagesRep. Dana Rohrabacher at a hearing on Capitol Hill, March 19, 2013. The appointment to the panel “sort of opened up a door for me to end up working in the Strategic Defence Initiative Organisation (SDIO), which then morphed into the Ballistic Missile Defence Organisation (BMDO), which then morphed into the Missile Defence Agency (MDA),” Baxter said in 2013. He’s also worked with the National Geospatial Intelligence Agency and contractors like Northrup Grumman. He was also a hit at the Pentagon. Military leaders brought him in to consult, regularly asking him to play the role of the enemy during war games. “I’m told I make a very good bad guy,” Baxter said in 2005. People who worked with him also told The Journal he could be a self-promoter. Jesse Grant/Getty ImagesGuitarists Orianthi, Jeff ‘Skunk’ Baxter, Slash, and Richie Sambora at the NAMM Tec Awards in Anaheim, California, January 24, 2015. Baxter has kept up his musical work. 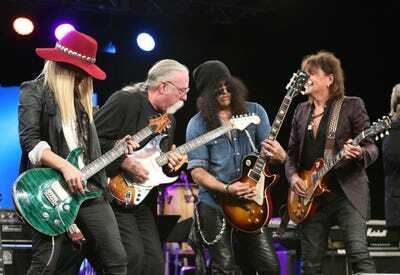 He became a sought-after session guitarist, working with acts like Dolly Parton, Rod Stewart, and Eric Clapton. In 2004 he flew 230,000 miles to reach all his gigs. That year he also made more money from his defence work than from music. For his part, Baxter has pointed to his creativity as his biggest asset. “We thought turntables were for playing records until rappers began to use them as instruments, and we thought aeroplanes were for carrying passengers until terrorists realised they could be used as missiles,” he said in 2005.